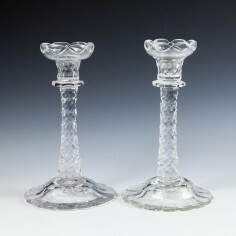 Victorian glass candlesticks, lustres and lamps survive in good numbers. With the industrialisation of Britain continuing apace across the transition from the Regency to Victorian eras, the composition of glass became more consistent, the material easier to manipulate and work with, and the scope of its uses exponentially broader; in fact we’ve already alluded to it being ‘the plastic of its day’, so commonplace did it become throughout the homes of the late 18th and early 19th centuries in many different guises. One such use was for the provision of lighting. 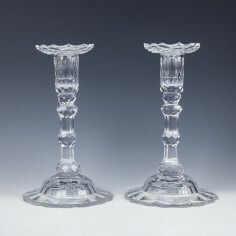 Glass had been used for candlesticks and candelabras for many years, and that continued to be the case, but it was also the go-to material for the production of oil lamps. It’s true to say that many glass lamps are just that – with a receptacle for oil in to which a wick would have been trailed, having originally been secured in a in a metal cap, the majority of which have been lost over the years. However, there are plenty of examples – with more capacious bowls – which seem to have broad, flared apertures that are too large to have been used to secure any such ‘wick holder’ in place. Colloquially known as ‘lacemaker’s lamps’ it is suggested that these were in fact used in conjunction with properly proportioned, working lamps, and filled with water which would scatter the light emitted from the nearby source over a wider area. Another illuminating oddity is the far less common ‘peg lamp’; these were bowl-shaped oil reservoirs, again with the facility to accommodate a wick-holding fitment, but with the intention being that they would be placed in to existing candlesticks and – therefore – instead of having their own stems and feet, they had just an abbreviated, candle-sized stub-stem which would fit in to the recess of the sticks – a fine example of repurposing existing items which would otherwise have been redundant. Whilst perhaps the best-know type of glass-made lighting accessory would be the extravagant ceiling-hung chandeliers which feature in so many period homes, the Victorians were equally adept at producing smaller-scale versions intended to be placed on tables or sideboards. These also feature a myriad of cut, sliced and facetted glass droplets, beads, tears and spheres intended to refract candlelight and create a dazzling effect, albeit in miniature. These pieces are known as lustres, and while some may be an acquired taste, it’s hard to imagine anything more spectacular which could be placed on a dining table, laden with cut-glass tableware, everything glistening in the light of flickering candles.